This long ponytail makes a big impression. It's basically a strip of hair sewn together. In their upper part is a small "clip", which is inserted into your short ponytail. Then you separate long thin strip of hair, which you wrap around your small ponytail and easily secure with a clasp. This kind of hairstyle perfectly holds all day long without need of any adjustments. If your hair is long enough to gather into a ponytail (even a very very small one) you can wear our clip in ponytail hair extension. 100% Heat Resistant Fiber is a high quality synthetic material that is indistinguishable from real human hair by look or touch. 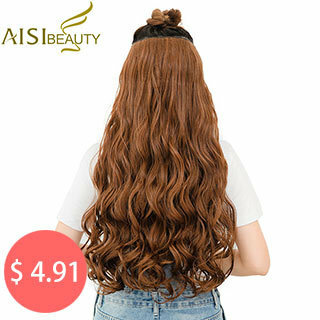 This special high-quality synthetic material retains its shine and brittleness is suppressed, that is why it is the best material for clip in ponytails. Experiment with different placement (high, low, side) to create different ponytail looks. Create a great new ponytail hairstyle by adding in length, body and shine by simply wrapping our ponytail wrap to your own hair! Everything is very simple and the results are perfect. treatment on them every few weeks, because the hair is not attached to your scalp, it is not getting the oils it should be. on low setting, but it is not recommended to do it too often. It is best to let your hair dry naturally after washing them. you are satisfied with our items and services. feedback. We will do our best to solve any problems and provide you with the best customer services. 1.Why the length is not the same as description? will be much shorter when compared with the straight hair, pay attention to that before you buy, Thank you! 2.Why the weight is not the same as the description? Because our product was made by machine, it is normal that it will exist 5-10g error. 3.Why does my hair become tangled? combing (wide tooth comb) out your hair daily. Make sure to wash and condition your hair at least once a week, and if possible, twice a week would be better. 4.Why does the hair shedding? so when your first coming, the floating hair will fall out, hope you could understand. 5.When will you ship my parcel out after i paid for my order? we will ship the goods within 24-48 hours after the verifying time. 6.How to deal with the odor?